Our "fujara" boarding house is located in Zavadka nad Hronom, a small willage lying at the foothills of Low Tatras in Hron river basin. Zavadka is surrounded by National Parks and the nature around is indeed amazing ! On the norht: National Park "Low Tatras"
On the south: National Park "Muránska planina"
35 km east National Park "Slovak Paradise"
several turistic and bicycle paths, within 35 km three turists-open caves. Learn and see some more of Zavadka village. Nature: In Slovakia there are 9 national parks and 14 protected regional reserves. The Hron river basin is a colorful landscape, with a variety of possibilities for active relaxation. In the environs there can be found a lot of curiosities - historic and cultural. The stay in this country can give you a lot of pleasant and interesting moments. The biggest attraction for tourists, rock climbers and lovers of beautiful nature is the National Park, Low Tatras, second highest mountain range in Slovakia. This mountain range is, almost, 100 kilometers long and found in the middle of Slovakia. Thanks to this fact, from its peaks it is possible to view, almost, the entire, surrounding country and this gives one a beautiful experience of the movement through a virgin nature, full of rare plants and creatures. Under the mountain range is found a continuous complex of caves, hundreds of kilometers long, which, so far, remain unexplored. The Muran plateau is the youngest Slovak national park. It is a landscape that stands out because of its richness in underground and surface natural beauty attractions: canyons, springs, lakes, crevices and cave systems. It is the largest natural beauty territory in central Europe. One can combine the wanderings in the nature with the examination of cultural and historic curiosities: castles and chateaus. In the bewitchingly beautiful nature remain, until now, preserved, traditional stiles of life: sheep corrals and horse farms. Muran is the region most known for equestrian and work horse breeding, in Slovakia. It is a country full of gems and it is, really, worth seeing. Slovensky raj (Slovak Paradise) is an area of exceptional natural beauty, and of rare flora and fauna. There can be few other places where it is possible to encounter within such a small area such an enchantigly varied landscape - meadows, chasms, canyons, gorges, plateaux, caves and waterfalls. For this is where dense spruce forests cloak the precipitous ravines the park has become famous for, where a healthy variety of wild animals roam the quiet valleys, and where meadows teem with more plant species per square metre than anywhere else in Europe.The northern slopes of the park are home to a series of deep clefts carved into the limestone hills. Water flows gently down deepening valleys until the walls close in, transforming serene streams into a series of crashing waterfalls. These rugged canyons would be impassable but for the ladders and chains that have been installed to carry hikers along dizzying heights over cascades and boulder-strewn stream beds. 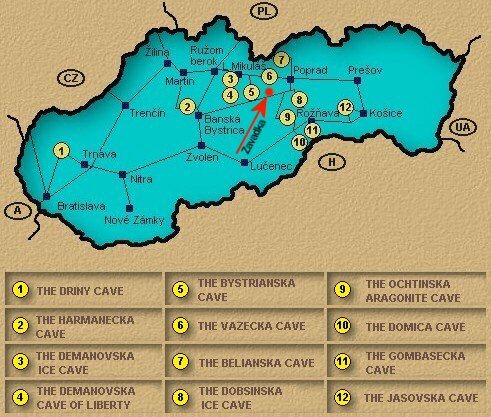 Slovensky raj (Slovak Paradise) includes 177 caves and chasms, 16 state reserves and numerous other unique natural attractions. Together with the Kriván peak is Králova hola (King's peak) the most famous peak in Slovakia. There are a lot of folk songs and legends about it. It is also a very important triangulation point of Slovakia, a place where the biggest rivers in Slovakia (Váh - respectively the Cierny Váh, Hron, Hornád and Hnilec) have its spring. The High Tatras mountains are one of the smallest mountain ranges in the world, nevertheless, they are the highest and the only mountain range of alpine system in the Slovak Republic. The territory of the High Tatras lies on 260 km of land. The highest point is Gerlachovsky peak (2655 m). There are numerous side mountain ridges spreading out to north and south of the main High Tatra ridge, all lined by deep and rustic valleys formed by the past glacier activities. As a reminder of this magnificent era the High Tatras uncover 85 mountain lakes on the Slovak side of the mountains. The High Tatras region is a frequent target of visitors from all around Europe and other continents, because of their unique beauty, wide possibilities of tourism, mountain climbing and skiing. The territory of the High Tatras , together with adjoining Belianske and Western Tatras, form the most important national park of Slovakia - The Tatra National Park.